Cover potatoes with water, bring to boil and simmer for 5 minutes; drain. Combine honey, wine, garlic, salt, pepper and thyme; mix well. 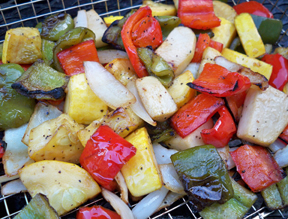 Place vegetables on oiled grill. Grill 20 to 25 minutes, turning and brushing with honey mixture every 7 to 8 minutes. 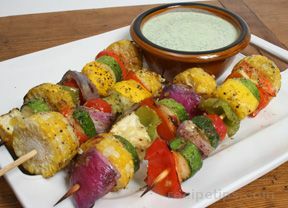 Oven Method: Toss vegetables with honey mixture. Place in baking pan and bake uncovered at 400° for 25 minutes or until tender; mix every 8 to 10 minutes to prevent browning.